It’s the Parsi version of the Creme Brulee and is essentially a bake of milk, eggs and cardamom. 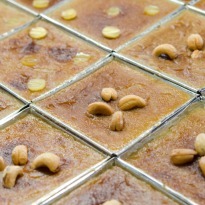 ‘Lagan-Nu-Custard’ is a Parsi dessert prepared during weddings. The name itself means ‘wedding custard’. Made with simple everyday ingredients like milk, eggs, butter and nuts. Cook milk and sugar together, to reduce it to half the amount. Add half the spice powder, half the nuts and the vanilla and mix well and cool. Mix the cream into the milk and beat the mixture into the beaten eggs. Should be brown on top. Cool and chill. You can also decorate with nuts.